Touchstone, 1987. Paperback. New. 8.44 x 5.5 cm. 1987-02-01. Good. Ships with Tracking Number! INTERNATIONAL WORLDWIDE Shipping available. May not contain Access Codes or Supplements. May be ex-library. Shipping & Handling by region. Buy with confidence, excellent customer service! Touchstone. Used - Very Good. Very Good condition. Touchstone. PAPERBACK. 0671640992 Special order direct from the distributor . New. Touchstone, July 1987. Trade . 3 PB standard 50%. Touchstone. PAPERBACK. 0671640992 *LIKE NEW* Ships Same Day or Next! . Fine. Touchstone. PAPERBACK. 0671640992 Very good copy with minor ink markings on pages. 8vo. 295 pages. books carefully packed and shipped promptly . Very Good. Touchstone, 1987-07-02. Paperback. Like New. New with remainder mark. Touchstone. PAPERBACK. 0671640992 * 20th printing. Some creasing to spine else very good. books carefully packed and shipped promptly . Very Good. U. S. A.: Clarion Books, 1962. Some edgewear and creasing of spine and covers,as well some age toning, otherwise still a good reading copy. Soft Cover. Good. Illus. by Illlustrated. Pimlico 1993. Octavo softcover (VG+); all our specials have minimal description to keep listing them viable. They are at least reading copies, complete and in reasonable condition, but usually secondhand; frequently they are superior examples. Ordering more than one book will reduce your overall postage cost. Touchstone. Used - Very Good. Great condition for a used book! Minimal wear. Touchstone. Used - Very Good. Ships from Reno, NV. Great condition for a used book! Minimal wear. 100% Money Back Guarantee. Shipped to over one million happy customers. Your purchase benefits world literacy! Touchstone. Used - Good. Good condition. With CD! With remainder mark. Touchstone, 1987-07-02. Paperback. Very Good. Binding tight.Cover clean.Minor wear to page edges and corners. No writing, highlighting, or marks in text.Paperback. Covers have edge wear, pages tanned, ffep has some crayon on it. The bestselling, classic text on one anthropologist's incredible experience living among the African Mbuti Pygmies, and what he learned from their culture, customs, and love of life. In this bestselling book, Colin Turnbull, a British cultural anthropologist, details the incredible Mbuti pygmy people and their love of the forest, and each other. Turnbull lived among the Mbuti people for three years as an observer, not a researcher, so he offers a charming and intimate firsthand account of the people and their culture, and especially the individuals and their personalities. 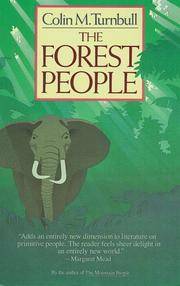 The Forest People is a timeless work of academic and humanitarian significance, sure to delight readers as they take a trip into a foreign culture and learn to appreciate the joys of life through the eyes of the Mbuti people. 295 p.
Touchstone. Used - Good. Good condition. Highlighting inside. Writing inside. Touchstone, 1987-07-02. Paperback. Very Good. Minor wear and tear on cover including smudging and creasing. No annotations or highlighting inside except school stamp on inside cover. No dog-eared pages. Spine uncreased. Touchstone. Used - Good. Ships from the UK. Shows some signs of wear, and may have some markings on the inside. 100% Money Back Guarantee. Your purchase also supports literacy charities. Touchstone, 1987-07-02. Paperback. Very Good.